Incredible images show the inside of an almost hidden six-bed property that featured in the Domesday Book and is now on the market for £4.5million. Ringleton Manor Estate, located in acres of green countryside between Canterbury and Sandwich, Kent, can be accessed by a quiet country lane and offers generous views of the surrounding parkland. The Grade II-listed property comes with a separate three-bed Victorian lodge house, well manicured lawns and water features that adorn the well looked after gardens. Located in the middle of beautiful yet secluded countryside, the property offers about 20,000 sq ft of accommodation and is ideal for the family. 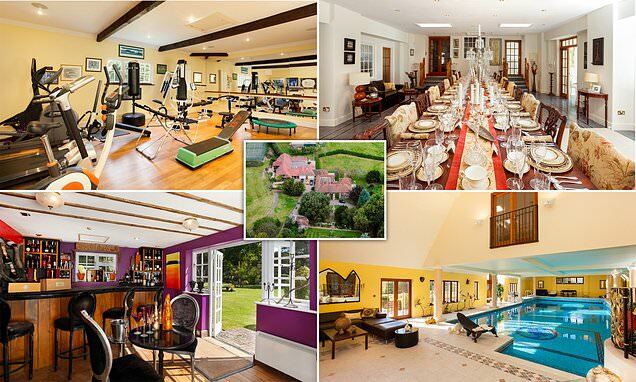 The stunning property in east Kent also boasts five reception rooms, two kitchens, a master bedroom and a library. A message of estate agent Strutt and Parker's website reads: 'Set in the middle of the estate, the house benefits from high levels of privacy and seclusion. The listing says: 'Mentioned in The Domesday Book and set in a little known and relatively undiscovered part of rural East Kent, The Ringleton Manor Estate is located in gently undulating countryside between Canterbury and Sandwich.